We were told that it is rainy season in this part of the country and we have definitely experienced it. It has rained almost non-stop since our arrival and the electricity is very intermittent. The hotel has a generator so whenever the electricity fails they fire up the generator, providing lights, but no AC. Last night was a litany of losing power, regaining lights on generator, lights off as they switch back to power and then lights on w/AC. Repeat. Repeat. Repeat. :) But once we fell asleep we didn't have to worry about it any more! We slept well. The morning brought an excitement about another day of testimonies. I so enjoy hearing these brothers share. Many of their stories are similar – opposition, death threats, hard conditions, but always the hand of God confirming their work, miracles happening and souls being saved. These guys are definitely the heroes of CSC! It's the same every where we go ... just as in Latin America, the brothers have such a passion for souls, such a willingness to suffer hardship, to travel long distances carrying the equipment on their shoulders, all for the purpose of winning souls. When we get to heaven I think there will be a special jewel in the crown of the CSC missionaries who have done so much to expand the Kingdom of God in the face of such opposition and hardship. A common theme is a request for prayer that God would raise up workers for the harvest. Many repeated the phrase, “The time is short.” There is a sense of urgency in many of these brothers that we must make the most of the short time we have left. But eventually the grandfather relented and called for some Christians to come to his home to pray for his son. The Christians were at first afraid to go to this Hindu priests home, thinking it was a trick, that he wanted to capture them to sacrifice them to his god. But they decided, “Though he will kill us, let us go and hear him and pray for his son.” The Christians came and prayed for the son and the son got healed! The Hindu priest asked them to teach him the way of the Bible and what he must do to follow Jesus. Eventually this Hindu priest was baptized as a public profession of his faith in Jesus. He led the people to tear down the large Hindu temple he had constructed and to build a Christian church in its place. The people agreed, but they were afraid to dismantle the place where the animals were sacrificed. Another pastor was called to pray and tear down the alter. As he prayed a large black cat came out from the altar making much noise, running away. The people tore down the altar and a church was built in that place and the former Hindu priest became the pastor! Our brother is the grandson of that Hindu priest and he has served God all his life. He is a Bible College graduate, a pastor, a church planter, oversees an orphanage AND is a member of the CSC film ministry in India! Praise the Lord! After a few more testimonies Patrick led the brothers through a slide-show of photos of our trip so far, introducing them to the ministry in the Philippines, Nepal and Pakistan. We ended with a photo of the Latin American conference in Costa Rica a couple of years ago, showing many of the film teams from Latin America, demonstrating what a large family CSC is. With great rejoicing we celebrated the blessings of the Lord on the CSC family. Then we broke for lunch. After lunch we gathered back together to continue our time of testimonies. We asked them if they would worship the Lord in their native language of Maleao. What a stirring time of worship ensued as they worshiped with all their heart! We were caught up in an atmosphere of worship that caused us to reflect on how it will be one day when around God's throne worship will flow from every language and every tribe to the only One worthy of receiving such worship. 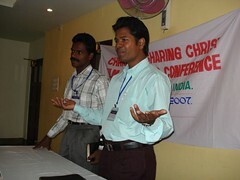 Brother after brother arose to share testimonies of how God has used film evangelism in their ministry. Every one shared the excitement of receiving a tool that can help them reach many at one time. We've shared the analogy of previously they were fishing with a pole but with a video projector they're fishing with a net! Most of these men are pastors, some are evangelists. They are understanding that CSC is partnering with them in their own ministry, that we are simply providing one tool to their toolbox. Many run orphanages, widows homes, Bible colleges and other types of outreaches. But they all are so excited to have the film projection ministry as an integral part of what they're doing for the Lord. What a great honor it is to be a part of their ministry and to be able to pray for them. Tomorrow will be our final day with the brothers. We will meet in the morning for prayer, worship and devotion. Then Patrick will go through the CSC manual and we'll have a closing lunch together. Thank you guys again for your love, prayers and support. As much as we're enjoying this trip, we are glad that it is drawing to a close. God's grace has been sufficient. But we are also looking forward to being with our families soon. Until the next update! P.S. I've only uploaded a couple of pictures today because I also uploaded the videos above, which takes time. But you can see the newly uploaded photos at: http://www.flickr.com/photos/nathanmartin/sets/72157600877967924/. You can easily browse through all the sets of photos from this trip at: http://www.flickr.com/photos/nathanmartin/collections/72157600836327992/. Hearing and 'seeing' this reports are like a fresh breath from heaven. You said, "Many repeated the phrase, 'The time is short.' There is a sense of urgency in many of these brothers that we must make the most of the short time we have left." What these brothers are saying about 'time is short' has been running through my own heart and mind. Perhaps it is time for the church to arise from her sleepy state. Here I am, almost 67 years old and it feels like a fresh anointing for souls has settled on me. May the Lord grant me strenth to carry out my part of the great commission in the days ahead. One thing that really stirs my heart is to read the testimonies of these brothers, in how that miracles are taking place in the name of the Lord Jesus. And these brothers are simple servants in God's kingdom. Thanks again son. Your mom and I love you more than words can say. Please let Patrick know that our love and admiration for him is always there.